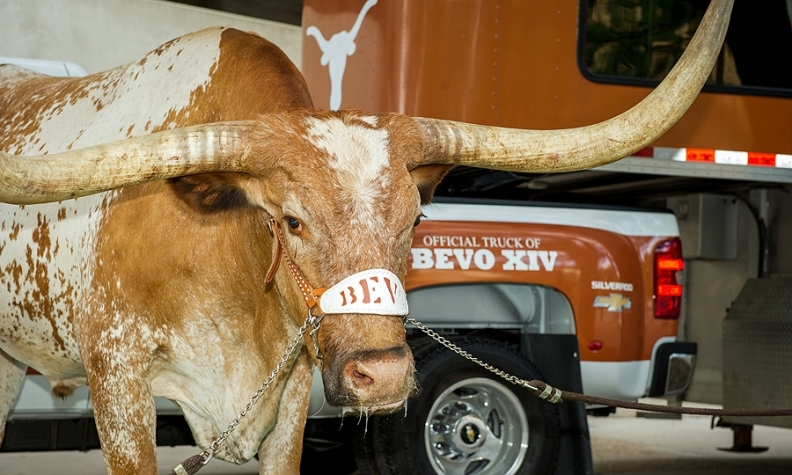 The Silverado will also be the official truck of Bevo, the Texas Longhorns' live mascot. Chevrolet, aiming to give a boost to the launch of the redesigned 2014 Silverado, has signed a multi-year marketing partnership with the University of Texas' athletics programs. Under the deal, the Silverado will become the official pickup of the school's athletic programs. "There is no more appropriate place to showcase the stronger, smarter, more capable 2014 Silverado than in the heart of truck country at Texas Longhorn sporting events," Chris Perry, vice president of Chevrolet marketing, said in a statement. It is the latest move by Chevrolet to make waves in the fertile Texas truck market as part of the Silverado launch. A Longhorn fan lives in one out of every three Texas households and is almost twice as likely to buy a truck as the average consumer, Perry said. Chevrolet said the partnership will connect the Silverado with UT fans and alumni at home sporting events and alumni gatherings throughout the school year. The deal also provides Chevrolet with a presence on the Longhorn Network, the 24-hour channel dedicated to programming associated with Texas Athletics and the University of Texas. "A partnership with a brand like Chevrolet is something that UT hasn't had in recent years, having partnered instead with local dealerships," said Skip Prince, head of strategic branding at the UT athletics department. In the past, the school has also partnered with Ford. Chevrolet launched a 60-stop promotional campaign across Texas in June to introduce the Silverado, which went on sale earlier that month. The partnership also includes deals with IMG College, a sports marketing company that services UT and other schools, and the Ex-Students' Association, the UT alumni association also known as the "Texas Exes."